A map shows Kizilsu Kirghiz Autonomous Prefecture in northwestern China’s Xinjiang Uyghur Autonomous Region. 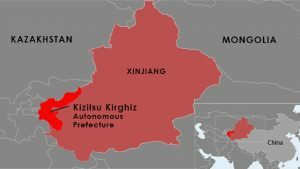 Authorities in northwest China’s Xinjiang Uyghur Autonomous Region (XUAR) are holding around one-fifth of the residents of a village in the region’s Kizilsu Kirghiz (in Chinese, Kezileisu Keerkezi) Autonomous Prefecture in “political” re-education camps, according to officials. Beginning in April 2017, Uyghurs and other Turkic Muslim minorities accused of harboring “strong religious views” and “politically incorrect” ideas have been jailed or detained in re-education camps throughout Xinjiang, where members of the ethnic groups have long complained of pervasive discrimination, religious repression, and cultural suppression under Chinese rule. An ethnic Kyrgyz officer at the Charlong Township Police Station, in Kizilsu Kirghiz’s Akto (Aketao) county, recently told RFA’s Uyghur Service that hundreds of residents of the town’s Payiz village—a Kyrgyz-populated area of more than 1,500 people—have been sent to the camps. “There are more than 300 … they are all Kyrgyz people,” said the officer, speaking on condition of anonymity. While some of the residents of Payiz “have relocated to different parts of Akto county,” most have been “placed in several camps” in the county, he said. The Kyrgyz detainees are mixed with Uyghur detainees at the camps and can accept visits and phone calls from their family members, according to the officer. “The majority of them were sent for re-education because they had inappropriate content on their phones, and others for their involvement in very minor misdemeanors,” he said. A staff member at the Akto county government office confirmed that Kyrgyz are being held in the county’s re-education camps, but said he was unsure of how many. The ethnic Kyrgyz are a Turkic people who make up less than one percent of the XUAR’s estimated 21.8 million residents and are largely concentrated in Kizilsu Kirghiz Autonomous Prefecture, along northwest China’s border with Kyrgyzstan. The small ethnic group had traditionally enjoyed relative autonomy under Chinese rule until Xinjiang Communist Party chief Chen Quanguo was appointed to run the region in August 2016 and initiated harsh policies depriving the fundamental human rights and freedoms of Uyghurs guaranteed by China’s constitution and regional ethnic autonomy laws. 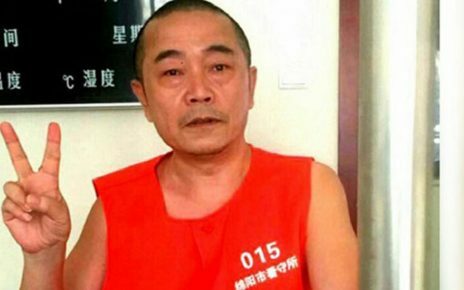 While Beijing initially denied the existence of re-education camps, the chairman of the XUAR government, Shohrat Zakir, told China’s official Xinhua news agency in October that the facilities are an effective tool to protect the country from terrorism and provide vocational training for Uyghurs. China’s state media have followed Zakir’s remarks with a massive propaganda campaign promoting the camps, while foreign reporters investigating Xinjiang have reported constant harassment by authorities. Uyghur activists called on China to prove the facilities are for vocational training by opening them up to visitors. On Tuesday, Scott Busby, the deputy assistant secretary in the Bureau of Democracy, Human Rights and Labor at the U.S. Department of State, said there are “at least 800,000 and possibly up to a couple of million” of Uyghurs and others detained at re-education camps in the XUAR without charges, citing U.S. intelligence assessments. These are the evils of the CCP. long time and yours is the greatest I have came upon till now.